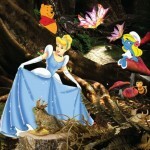 Skaters will go through the fairy tale looking glass and take you on a trip through an enchanted forest. The heroine, Red Riding Hood is in a race against time to beat the Big Bad Wolf through the forest to Grandma’s house. Along the way she will bump into some regular residents of a fairy tale forest such as Hansel and Gretel, Rapunzel, Cinderella, Peter Pan,Winnie the Pooh, Robin Hood and his Merry Men and The Ugly Duckling. Kids who are two and under are free when they go on their parents lap. Tickets are now available on TimeOutTickets.com at Abu Dhabi Ice Rink, Khalifa International Bowling Centre and the International Tennis Complex. *The characters in the show are not affiliated with the original productions: they are interpretations created by Abu Dhabi Figure Skating Team.